Showing results for tags 'slaughterpriest'. 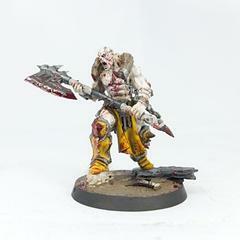 Slaughterpriest made from a Bloodreaver in the Sigmar starter box. 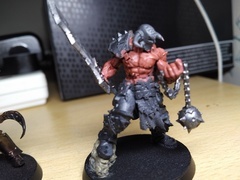 His head is from the Flagellant kit, and the pieces he is burning are from the Fireforge Steppe Warrior kit. 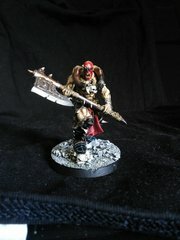 My Blades of Khorne are themed around tribes from the Wastelands of Ghur that worship a God of Fire who is actually an aspect of Khorne. It has been far far too long since I updated here. There have been some excellent releases recently that have reignited interest in painting. The main theory was that the two Warhammer Quest boxes provide a fairly varied starter set for a small Arcanite force and shouldn't need too much adding to bulk it out a bit more.  Anyone that has had the misfortune of reading my threads over on Dakka know that I have lots of ideas and only occasionally get around to fulfilling them all as I'm very easily distracted... so hopefully you can keep me on track with some semi regular posts. I've been experimenting with colours for the Arcanites and the theme appears to have evolved into a combined Chaos force (Tzeentch/Khorne) under the command of a demon known only as the King in Yellow. No-one (least of all me) is quite sure how he has persuaded these two groups to join forces. I have plans for the King, but won't go into them here and now as they need a bit more fleshing out. 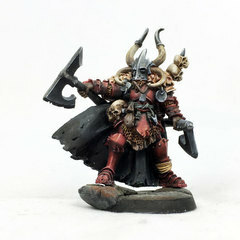 The prototype Arcanite is this Tzaangor: For the Khorne forces, I've started putting paint to the Gorechosen figures. The yellow of these is actually what started the whole King in Yellow theme. 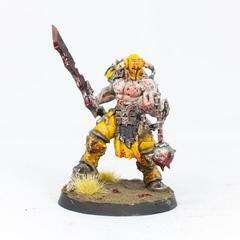 I know there are a couple of other yellow Bloodbound forces on here and really liked the very different take on Khorne, so thought I'd give it a try on one Once he was complete, I needed to find some way to tie him into any other Chaos forces that I did. The Khornate forces are now amore orangey yellow, grey skin tones, black and steel; Tzeentch is a more lemonn-y yellow, purple/blue/turquoise and silver. With those rules now set, I attacked the next most common Slaughterpriest to see if it still flowed through. So, do you think it works? The start of one of teh first minatures i've painted in 2o years. Flesh currently based in Bugman's Glow and shaded with Reikland Fleshshade. Will layer over with a lighter colour and probably re-shade. Currently considering best colours for cloth and helm. So here's what I've painted over the last week, first up is my white dwarf slaughterpriest conversion using blightking parts and a little green stuff. Second is the first of two models that I'm not sure what they'll work as warscroll wise, so if you have ideas comment below. They're made from minotaurs with giant heads. Next are a unit of plaguebearers, I painted them last week but got the basing done this week. I just wanted to show how a basic unit of mine looks. The scheme takes no time to paint. In fact I painted these guys between getting home from work one night and going to bed which was less than 2 hours. They're spray primed, then sprayed green or yellow. From they're I was them with nuln oil, then coelia greenshade, while the wash is still wet I dab areas with feugan orange. Then I drybrush the models with ushabti bone to highlight. Then I move on to the weapons, they're based with runefang steel, they get one coat of tamiya clear blue, and one of tamiya clear green and finally an all over of nurgle's rot. Then I pick out the eyes with yellow (I can't remember it's name) and wash them with feugan orange. Then I pick out all the scabs, guts and mouths with tamiya clear red and do the odd pustule or wound with clear blue or clear green. Then they get a spray with a clear gloss varnish... done! Two spawn I've had for a while, but finally got painted. Finally a blast from the past, or rather a unit I got together before starting this blog: three beasts of nurgle. They're swamp trolls or fellwater troggoths (I think?) with spare plaguedrone heads. Thanks for stopping by! Hi, i bought the White dwarf yesterday and now i own the slaughterpriest with hackblade. When i checked the warscroll, i noticed that there is a difference compared to the other slaughterpriest in the abilities 'scorn of sorcery'. With hackblade can explicite just ban one spell, the other can ban spells. It should be the same, because both are slaughterpriest... is it a huge difference or just a mistake from GW? After a few crazy weeks at work I return!! Finally got some hobby in this week and finished all the base coats and shading on my first batch of blood reavers. 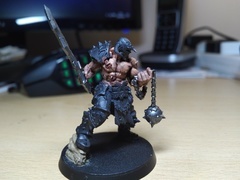 I am really enjoying building my bloodbound. AoS is infectious! My small warband is growing and creating its own character as I paint up units and characters. Ive managed to catch up on all my pod casts and particularly annoying recent topics regarding painting time and optimising painting opportunities. 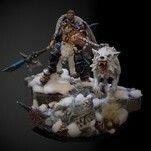 picked up my new white dwarf, dropped it in water, bought another and now have 2 awesome slaughterpriest to play with. With Mr Curry announcing a fun painting comp this month with the free model I thought I'd have a go. I'm going to try something completely different with this guy and try a different colour pallette. I really want to improve my painting so any opportunity to do it, like competitions, is an excellent way to help me. Talking of new white dwarf, WOW! 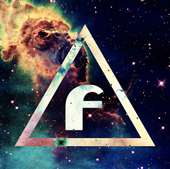 !, it's so awesome! This last year has brought my hobby back to when I was just starting out and everything was exciting, looking forward to every release and nugget of newness. I'm even sniffing every new book again ;D GW for life! !